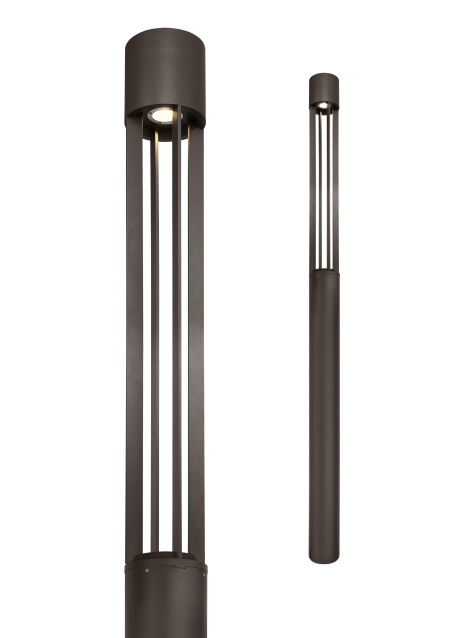 The distinctively contemporary modern Turbo outdoor lighting family by Tech Lighting includes a cylindrical light column, a powerful outdoor LED solution for general illumination and area lighting. Highly customizable to suit its immediate surroundings, the Turbo light column offers optional optic beam spreads (20° or 40°) as well as two different lumen output options. The clean design ensures that even multiple fixtures will complement its setting. The Turbo light column is 12-feet tall and features a durable, marine grade powder coat finish available in two finishes. Charcoal or Bronze. The Turbo light column features stainless steel hardware and impact-resistant, UV stabilized acrylic lensing for added durability and stability. Choice of beam spreads. 20° or 40°. Length -- Choose -- 144"